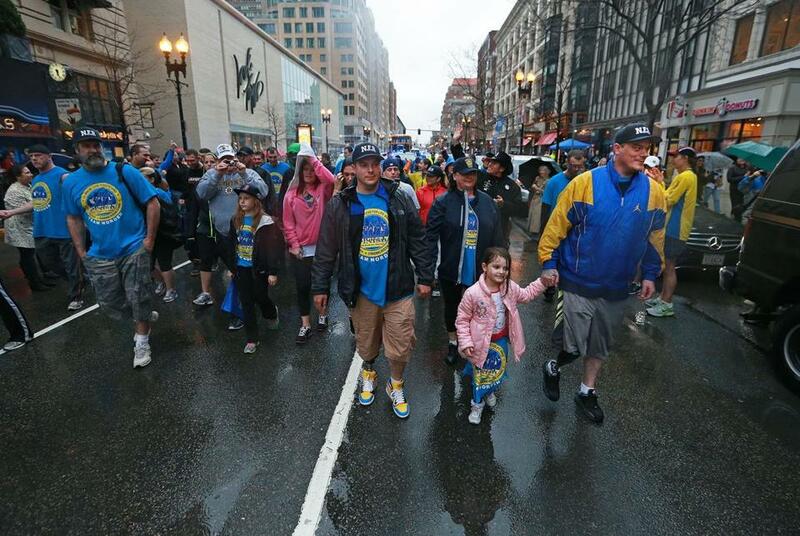 Brothers J.P. Norden (front, left) and Paul Norden (at right, holding the hand of his niece Gabbie) walked toward the Marathon finish line along with a large group of family and friends. ASHLAND — When Hawley Cheney heard that the two Stoneham brothers who each lost a leg in last year’s Boston Marathon bombings were going to be traveling the 26.2 miles from Hopkinton to Boston Tuesday, he knew he had to be there. Cheney, of Framingham, said that he has struggled with his own issues in the past and that meeting Paul and J.P. Norden near the Marathon starting line in Hopkinton was a special experience. The brothers, along with about 50 friends and family, walked a little, stopping and talking to supporters, grabbing a quick something to eat, getting back onto their bus, and repeating the pattern over and over along the 26.2-mile route toward the finish line where a year ago Tuesday their lives were forever changed. The pair crossed the finish line at 6:30 p.m.
“We decided we’d rather spend the day with our family and friends than just remembering what happened,” Paul Norden said. Their mother, Liz Norden, who has been beside them since the start, said the first-year anniversary symbolizes a new start for the family. About 100 students from Ashland High School met the brothers’ entourage at the 7-mile mark, walking down the hill from school during their study hall. A couple drove from Littleton and waited in front of St. Tarcisius Church in Framingham with water bottles and bananas “because we think it’s important to be here for them.” And two friends from Ashland heard about what was happening on the television news, texted each other, and ran out the door. “We had to be here to show our support,” said Kristine Kaveney. Four Framingham town employees waited in the drizzle across from the train station in downtown for nearly an hour waiting for the brothers to pass by. “It is important to show them that Framingham is supporting them and supporting what they are going through,” said Heidi Bryce. “It was very moving and very exciting to see them and to see their enthusiasm,” she said. For J.P. Norden’s girlfriend Kelly Kastine, the day is hard to describe. “A year later, here we are again; it’s weird,” she said. Correction: An earlier version of this story contained a photo caption that incorrectly identified a person . Gabbie is Paul and J.P. Norden’s neice.